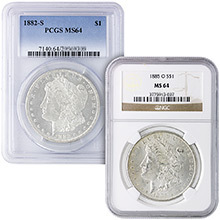 The Silver American Eagle coin is widely considered to be one of the most beautiful coins ever minted, and continues to be one of the most popular investment bullion coins sold today. 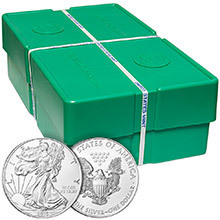 Our low prices on American Silver Eagles, whether singles, US Mint Fresh Rolls, or Mint Sealed Monster Boxes, have made us a large dealer in these popular coins. 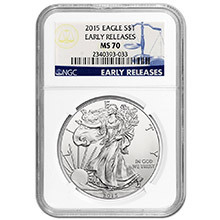 American Eagle Silver Coins contain one ounce of .999 fine silver and are available in bullion, proof or certified collectible investment grades. 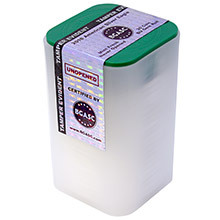 The Silver Eagle began production in 1986 and was the first silver coin produced by the United States Mint since 1964. 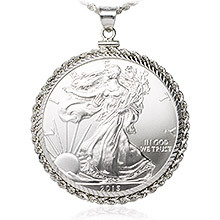 The obverse of the Silver American Eagle designed by Adolph A. Weinman features the majestic Lady Liberty walking across the land with a sunrise illuminating her path. She is draped in a gown of stars and stripes and carries a bundle of laurel and oak branches. 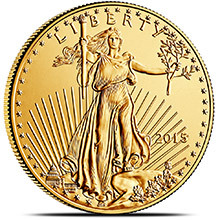 Also on the obverse are the date of minting and the words "Liberty" and "In God We Trust". The reverse side of the American Silver Eagle designed by engraver John M. Mercanti features a depiction of a bald eagle, wings outstretched, bearing a shield and E Pluribus Unum banner. 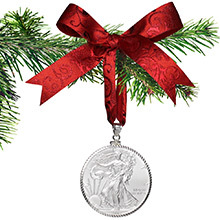 The silver eagle holds an olive branch in one talon and a cluster of arrows in the other. Also on the reverse are the words "1 Oz. Fine Silver" "One Dollar" and "United States of America". American Silver Eagles are composed of .9993 silver and .0007 copper and are relatively large coins measuring 40.6 mm in diameter. 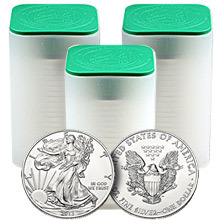 Bullion (business strike) Silver Eagles can be purchased in single quantities or tubes of 20 as well as mint sealed monster boxes of 500 coins.